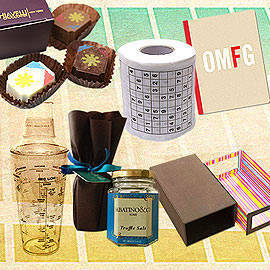 Pocket-sized <em>payong</em>, Sudoku toilet paper, the "cheat sheet" shaker, and more! We got our hands on some pretty nifty stuff this week. Check out the purse-friendly payong we found that’s no bigger than a foot-long ruler, plus a novelty toilet paper roll with Sudoku puzzles printed on it and this really cool "cheat sheet" cocktail shaker we unearthed for your next inuman session with the gang. And, more fun food finds: customized chocolate art, yummy coffee-flavored candy, and sprinkle-on-anything truffle salt to jazz up your favorite food (including popcorn!). 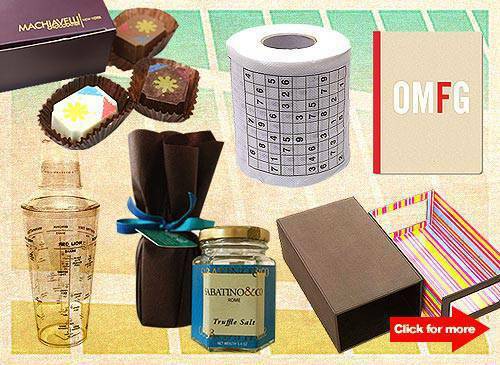 A purse-friendly payong, Sudoku toilet paper, the "cheat sheet" shaker, and more! Click for more.